Here's a great ring for princess cut lovers. 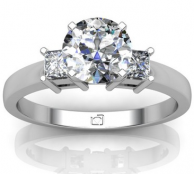 You get two princess cut diamond side stones, and, in case you're not a complete princess cut addict, you can choose any shape diamond to put in the center. (Although, if you ARE a princess cut addict, you do still have the option to choose a princess cut stone). Each diamond sidestone is around .1 carat, so they are pretty small side stones (this also helps your main diamond appear larger! ).